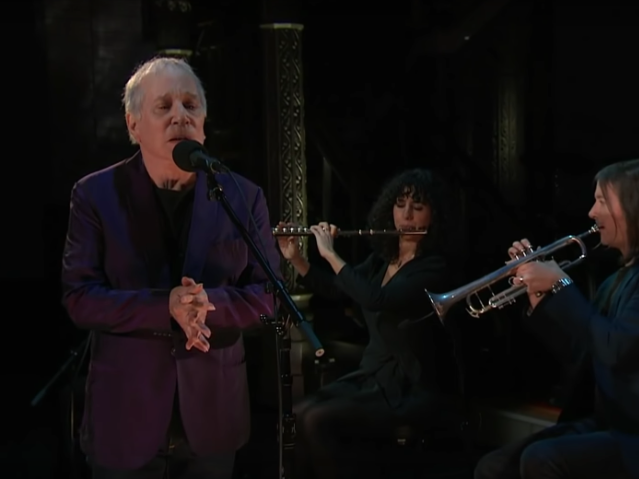 Paul Simon appeared on The Late Show With Stephen Colbert last night, putting down his guitar to perform an updated arrangement of his 1983 song “Rene and Georgette Magritte with Their Dog after the War” with accompaniment from contemporary classical ensemble yMusic. In a digital-only bonus performance, Simon also performed his retake on the bluesy There Goes Rhymin’ Simon track “One Man’s Ceiling Is Another Man’s Floor” with Colbert’s house band Jon Baptiste and Stay Human. The newly-recorded and revamped versions of both songs were included on Simon’s 2018 self-covers album In the Blue Light. Simon also sat down for a playful interview with Colbert, joking about continue to perform even though his auspicious farewell tour concluded last year. “The farewell tour was basically just to bump the prices up,” Simon joked. Simon discussed donating to local charitable causes in every town he visited on the tour, mostly to “ecological causes” and music educations organizations. Simon said that while he would not be touring anymore, he intended to continue to perform and donate all proceeds from those future performances to charity. He also discussed performing the final concert of his tour in his home borough of Queens, and the process of rewriting parts of certain old songs for his last album. Simon was the musical guest on Saturday Night Live in October of last year. Watch the interview with Simon and his two performances below.